One of the most challenging problems for new dog owners is their pup’s separation anxiety. Your pup’s anxiety can cause a plethora of problems both for you, your family, and your potential sitters. However, if you are willing to implement a few strategies and tactics into your dog parenting routine, you can circumvent and avoid this problem altogether, making both your life and your puppy’s a lot easier. One of the biggest reasons that dogs suffer from separation anxiety is that they are uncertain about who the pack leader is. This creates a sense of fear and worry in their minds and leads to the wild neurotic behavior with which you have become so familiar. The best way to prevent this is to clearly display that you are the pack leader. Make sure that when you invest time with your pup, your actions are congruent with those of a pack’s “top dog”. For example, if you are walking your dog, make sure that you are the one taking the lead and controlling your time out. If you are playing with your dog in the house, be sure to always be the “winner” of the matches, whether this means flipping them over and rubbing their belly, or being the last one to snag a toy. Also make sure that whenever you feed your dog, you eat first. Never let your pup dine before you do. If you implement these simple behaviors, you will quickly establish dominance and set your puppy’s mind at ease, making the rest of the process a breeze. One of the worst things that you can do when you have a dog with separation anxiety is to draw out the greeting and departure times during your day. Whenever you leave the house, pet your dog once and leave quickly, do not draw this process out and try to soothe your pup. 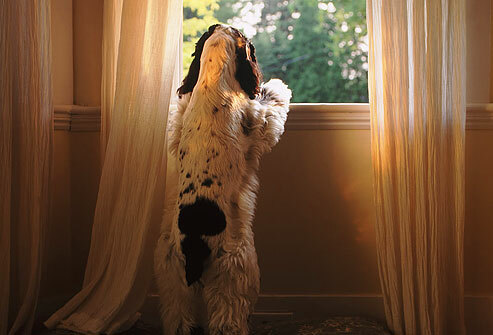 Whenever you arrive at home, do not give your dog any attention if they are wild and rambunctious. Wait until they have calmed down before you reward them with your time and praise. If your dog is suffering from severe separation anxiety, then it is important that you either walk the dog yourself or hire someone else to do it before you leave for the day. This will allow your pup to relax and eliminate some of the stress associated with your departure. In addition to long walks prior to your exit, you also want to be sure to leave your dog with familiar items whenever you are away from home for an extended period of time. If your dog is at a kennel or boarding home, be sure that you bring along a familiar bed, toys, and an old shirt or two to keep them calm in their new environment.